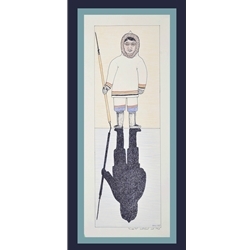 In these ten previously unreleased drawings, Kananginak Pootoogook’s observant eye and his love both of the land and his people have portrayed the traditional lifestyle of the Inuit faithfully. Kananginak has captured the physical details of the survival customs, gear and clothing of the Inuit. With his sure hand, he has portrayed psychological insights into man-and-nature, man-and-animal and animal relationships. With graceful lines and subtle coloring he has created a touching sympathy for his subjects. The drawings are marked by Kananginak’s habitual verve and his abiding sense of humor. Note the animated tenderness which the artist has brought to the woman ice-fishing in drawing 999 – the startling introspective sense of self he has depicted in drawing 1632 – the superb qualities of drawing 866: in outstanding graphic detail, the racing eider duck couple’s speed is coordinated with the birds’ postures as they communicate with each other – and the measured, proud walk of the handsome Inuk laden with fox skins in drawing 1748.